About the magazine Buddy magazine was first published in July 2007 - issue #1: special Vietnam. Buddy coming - out already fourth year like bimonthly, with minimum pages 84, on chalk high - quality paper (135 g inner and 200 g envelope with lustre and laminated fabric). 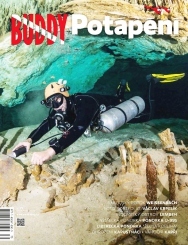 To year 2010 is for subscriber and diver's retailers in every issue Buddy ready for freebie! What about inside? All types of diving, dive travel and expeditions, resorts, adventures and photo-stories, dive equipment, profiles of people with significant achievements in diving, diving events and shows, marine biology and ecology, oceans, wrecks, reefs, trends, marine archeology and other. Buddy partnership Buddy is medial partner diver's show HLUBINA/ DEPTH 2010. Buddy stated official partner expedition “WRECKS SHADOW 2007 - 2009”. Buddy stated official medial partner 7. International festival outdoors films 2008 - 9. Distribution Buddy extends except subscribers and nets PNS over diver's clubs and base, travel agencies, libraries, hospitals, sports club, sports tilt, trade shows and dive events. Advertising Benefits and about Ads In Buddy find maximum 19 % as pages of advertising. Your advertising hence will keep among others. As soon as number advertising as regards saturating to the of the number of 20 %, we grows up automatically pages, to per cent advertising was again max to the 19 %. Placement of client advertisements is also available on the website. Advertise on the website Buddymag: Website launched July 2007, updated weekly max. monthly with latest news and bi-monthly with a new issue. Here is an opportunity for you to extend your business by having your own site linked from Buddymag or having your pages hosted on the Buddymag site at realistic rates. All-inclusive advertising packages Bannerads - website - buddymag.cz Public Relation - e-zine - Dive Time Print magazin - bi-monthly - Buddy Our customer offer to areal advertisement in the magazine diver BUDDY and bargain prices for banner and presentation on website Buddymag.cz and possibility PR articles free in our electronic magazine DIVE TIME that the them to a Internet to download free. Graphic form advertisement and translations texts to the advertising we're able mediate between. Discounts apply for serial insertions. Size of ads Spread, Half Spread, Full Page Half Page - horizontal x vertical Third of a page - horizontal x vertical Sixth of a Page - 1/6, Eights of a page - 1/8 (horizontal). Price pr insertion we will send by e-mail. Acceptable File Formats ADOBE PHOTOSHOP, 300 dpi, TIFF, 300 dpi, High-resolution, press-ready ADOBE PDF, EPS, fonts converted to outlines or CD/ DVD. Issue dates Issue #2 /April 2010 Publication: 30 Apr 2010 Reservation deadline: 27 Mar 2010 Copy deadline: 1 Apr 2010 Next issue: June, August, October, November. 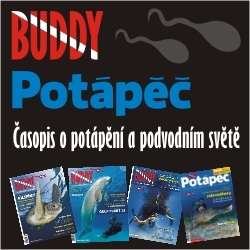 ADVERTISING RATES REQUEST For details of advertising rates for Potapec Buddy and buddymag.cz, please fill in the email form below and send by e-mail. PLEASE NOTE : You MUST fill in ALL fields of the form or we cannot process your enquiry.